The Tampa Bay Lightning have acquired Florida’s second-round pick in either 2012 or 2013 (previously acquired, Florida’s choice), a fourth-round pick in the 2013 NHL Entry Draft and left wing Jon Kalinski from the Philadelphia Flyers in exchange for defenseman Pavel Kubina, Vice President and General Manager Steve Yzerman announced. Kalinski will be assigned to Norfolk of the American Hockey League. The Lightning now have a possibility of four selections in the second round of the 2012 draft after acquiring Minnesota’s second-round pick from San Jose in exchange for Dominic Moore and a seventh-round pick on Thursday. They also acquired Philadelphia’s second-round draft choice on July 1, 2010 in exchange for defenseman Andrej Meszaros. They would have a minimum of three picks in the second. Kalinski, 6-foot-1, 186 pounds, has played in 40 games with the Adirondack Phantoms of the AHL this season, recording nine goals and 12 points. He has played in 233 career AHL games with Adirondack and Philadelphia, registering 35 goals and 83 points with 186. Kalinski has also played in 14 career Calder Cup Playoff games, notching two goals and six points. 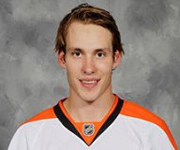 He has played in 22 career NHL games, all with the Flyers, recording a goal and five points. A native of Bonnyville, Alberta, Kalinski was drafted by Philadelphia in the sixth round, 152nd overall, of the 2007 NHL Entry Draft.